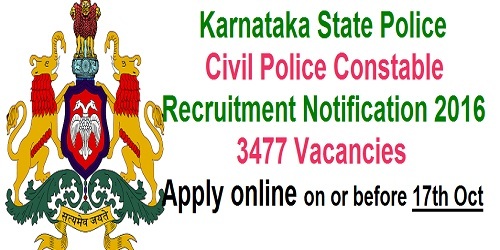 Karnataka Police Recruitment Notification 2016: Karnataka State Police announced about its 2016 recruitment for Civil Police Constable posts on 14th September 2016. 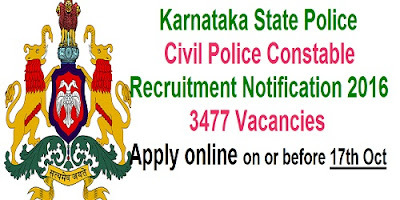 The vacancies available in this recruitment of Karnataka State Police 2016 are 3477 Constable (Civil) posts. Karnataka Police Recruitment Board is inviting all Indian male and female candidates to apply for this recruitment through online. Online applications for this 2016 Civil Police Constable recruitment of Karnataka State Police (KSP) are opened from 21st September 2016 in the official website of KS Police Recruitment 2016 http://rec16.ksponline.co.in/ or http://pcnhk16.ksponline.co.in. The Candidates who are interested in this opportunity of KS Police Department, Go through the entire details of the notification like how many vacancies are available? What are the required eligibility criteria? What is the age limit? How to apply online? & etc. After reading and understanding the essential details of KS Civil Police Constable recruitment 2016. The candidates who are eligible for the Civil Police Constable post of this recruitment can apply for it through online on or before 17th October 2016. Here are the brief and essential details or information about Karnataka Police Recruitment Notification 2016 for 3477 Civil Police Constable posts. if you want to check the official notification of this recruitment then click on the official notification link which is given at last of this article. Eligibility Criteria: the candidate’s minimum required eligibility criteria to apply for this KS police recruitment 2016 like educational qualification, age limits, physical standards and etc. - PUC, 12th Standard (CBSE/ICSE/SSE) or its equivalent. Chest: Must not be less than 85 centimeters round the chest on full inspiration with a minimum expansion of 5 Centimeters. Written Examination: Objective type written test (in English/Kannada) with 100 questions for 100 marks and negative marking system is there for each wrong answered question i.e., 1/4th marks of that question. Time duration for the written exam is 90 minutes. Online applications are opened from 21st September 2016. Closing date for online applications is 17th October 2016. Last date for Application fee payment is 18th October 2016.